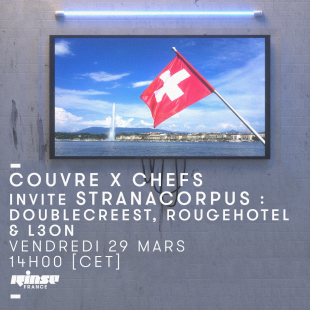 Last week we received the excellent Swiss crew Stranacorpus on our monthly show at Rinse France. In the evening, they played at our party organized at 9b (and the walls still remember). Stranacorpus is a Geneva-based artistic entity working in various creative and complementary fields such as fashion, 3D creation – via their integrated studio – hornusstudio – or even music. The collective, made up of half a dozen members, has been developing 360 ° projects since 2016, ranging from the mixtape to the video clip or the capsule clothing collection.